From 16th to 20th July, 30 students of economics from universities based in Serbia took part in a study visit to Brussels which provided them with a unique opportunity to learn on the spot about the European Union institutions in Brussels, how they function, the accession process and current economic topics within the EU. The participants were chosen following an open call during April and May to all last year or/and post graduate students from the University of Belgrade, University of Novi Sad, University of Niš, University of Kragujevac and University of Novi Pazar. More than 60 applications were received, of which the top ranked 30 students were selected based on their academic records, motivation letter and extracurricular activities. Ambassador Sem Fabrizi, Head of the EU Delegation to Serbia met with the students the day before their departure to Brussels in the premises of the EU Information Centre in Belgrade. On this occasion, ambassador Fabrizi talked openly with the students for over an hour on the EU and Serbia’s accession process, while the students had the opportunity to ask questions and present their views on the economy of the European Union, its future and were eager to learn on the opportunities for young people in today’s European Union framework. The 4 day visit provided the students with firsthand experience and information on the EU through meetings with officials at European Union institutions dealing with economy and finances, youth and education. They visited the European Economic and Social Committee where they were introduced to the important topics on youth and labor market trade unions and civil society organisations in Europe. 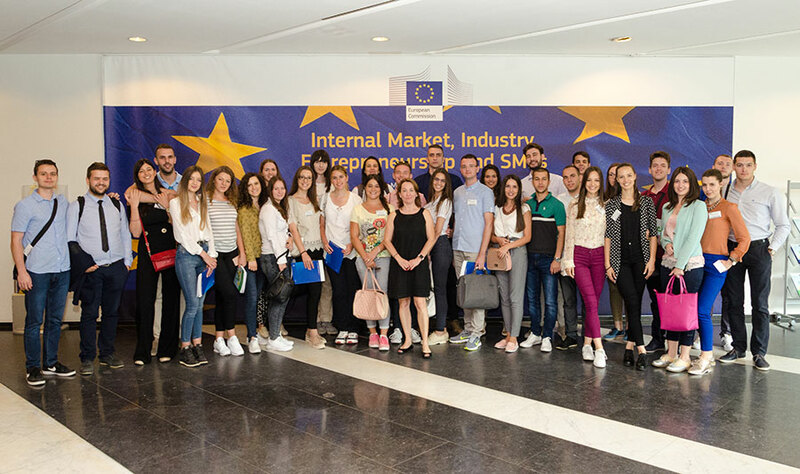 Students also met with officials at the European Commission Directorate General units dealing with economy, finances, youth, education and the EU-Serbia accession negotiations i.e. the Directorate-General for Economics and Financial Affairs, Directorate-General for Education, Youth, Sport and Culture, Directorate-General for Internal Market, Industry, Entrepreneurship and small and medium-sized enterprises and Directorate-General for Neighbourhood and Enlargement Negotiations. These meetings provided valuable insight on the functioning of the European Union in a number of important topics and sectors which all or some, have been covered through their studies. The study visit programme included also visits to other organizations in Brussels such as The Association of European Chambers of Commerce and Industry and the European Trade Union Institute. These visits provided the students with practical knowledge on how these organizations work as well as insight about the activity of one of the Europe’s finest think tanks – Bruegel. The programme also included a visit to two museums closely related to the European Union – “Parlamentarium” and the House of European History. One of the results of the visit is that the students seem to have acquired a clearer view on the prospect of their future career development and the opportunities being offered to them within the European Union. Based upon their impressions, this kind of visit gave them additional boost in building up their future, within the environment related to the European Union. As a follow up of the visit, all students have been tasked with researching about the EU and its Member States. At the meeting with ambassador Fabrizi, each student was given a small task in collecting material and doing a research on one European Union member state, candidate country, as Serbia is and European Union. By the end of the first week in August, students should come up with developed video or multimedia presentation on their research. Out of those videos and presentations, top 3 will be awarded and promoted on the official EU Delegation in Serbia social media platforms. The study visit is a part of the EU funded project “Visits to EU Institutions and Member States”.